One of the most commonly asked questions is, how do I clean this stone? Although the cleaning of a gravestone may seem quite simple, this is not always the case. Every time a historic stone is cleaned, some of the stones surface is removed in the process. Clean it too often, and all the inscription and details may be washed away! Competent preservation and conservation work includes careful planning; solutions that don’t compound the problem; actions that are the least instructive; treatments that respect the original fabric; and, work that is carefully documented for any future work. 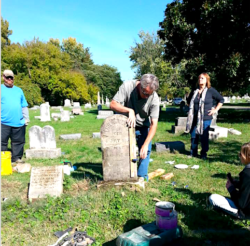 Improper treatment can cause irreversible damage to historic cemeteries, so it’s critical that the right techniques are used to preserve and stabilize the stone and prevent them from further damage and deterioration.